Cherry blossom viewing at my house last week -- just need to look out the upstairs front window. The Yamabushi, under the falling blossoms last Friday. 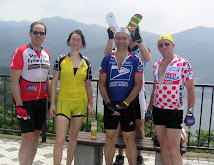 I'm really looking forward to the Golden Week Saitama Audax Brevets that Jerome and I are planning to join to Aomori. If all goes well, we will have cherry blossoms and other flowering trees much of the way as we head North.